(2-LP set) "On Call" is the 3rd album by Peter Erskine & The Dr. Um Band, a double packageLP with six studio and five 'live' tracks, featuring keyboardist/arranger John Beasley, saxophonist Bob Sheppard, bass phenom Benjamin Shepherd and legendary drummer Peter Erskine. With an album cover that recalls Weather Report's "Night Passage" album (which featured live & studio cuts), the Dr. Um Band realizes the musical potential of fusion and completes a picture that Joe Zawinul and Wayne Shorter began painting 50 years ago. 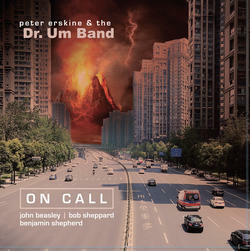 From the first track's uncanny and authentic evocation of WR to its thrilling concert cuts, "On Call" is the album fusion fans have been waiting for. Plus, it swings & sounds great.